RECON ULTRA Smoke Odor Sealer is a premium solvent free smoke odor sealant and stain blocker designed to eliminate malodors on multiple surfaces and block tough staining. Ideal for structural, finished and decorative surfaces, RECON ULTRA Smoke Odor Sealer with OdorLock Plus provides one-coat odor control on most surfaces and continues to block odors even with seasonal changes in temperature and humidity. 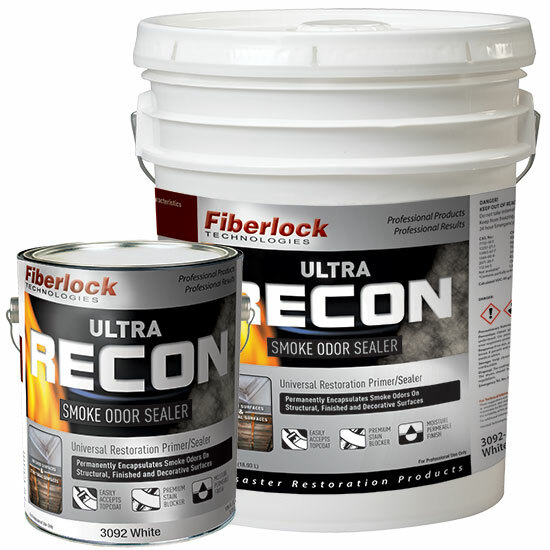 Prior to applying Fiberlock’s ULTRA RECON Smoke and Odor Sealer it is critical that the substrate be thoroughly cleaned. Smoke odor encapsulation is a final step that needs to be part of a comprehensive smoke/odor management protocol. This protocol should include the following steps: odor cleaning, odor neutralization and odor encapsulation. Fiberlock recommends cleaning with RECON Heavy Duty Cleaner or Extreme Duty Cleaner, followed by the application of RECON Extreme Duty Odor Counteractant. After the substrate is clean, dry and sound, apply ULTRA RECON Smoke Odor Sealer to encapsulate any residual odors that remain. Apply ULTRA RECON Smoke Odor Sealer with a brush, roller or airless spray equipment. Clean tools and drippings with warm soapy water before ULTRA RECON Smoke Odor Sealer dries. Dispose of waste according to all existing local, state and federal regulations. PRECAUTIONS Store in a dry place at temperatures between 40°F (4.5°C) and 90°F. (32°C). Stir thoroughly. Do not mix with any other coatings, additives, solvents or colors in oil. Do not apply when air or surface temperature is below 45°F, or when drying conditions are poor or when surfaces are above a 15% moisture level content. In areas with high humidity, apply when surface temperature is 45°F or higher. Use adequate ventilation during application. When applying with a sprayer, wear a NIOSH approved respirator with any R, P, N or HE filter.